Vendors love buzzwords and phrases and nothing exemplifies this more than the term Software Defined Storage or SDS. Look back a few years ago and storage appliances were going to be replaced by commodity hardware driven by software. Naturally that was the hope of those vendors selling software-only solutions; they needed end users to believe that the age of buying bespoke hardware was over. Has SDS lived up to the hype? Have we really moved to an era of software only solutions? One of the problems with SDS is that there’s no real agreed definition of what Software Defined Storage actually means. When this happens, vendors who shouldn’t be in the space, choose to jump onto the bandwagon and claim they are “software defined”. As an example, look at broadband provision in the UK. Currently “Superfast” broadband is defined as anything above 24Mb/s (although there has been confusion caused by the UK government’s own authority that indicate Superfast may mean 30Mb/s+). So with my 200Mb/s offering from Virgin Media, how would that rate? Ultrafast, Megafast? Customer’s believe 24Mb/s is probably as good as its going to get, because the term “Superfast” implies it is at the top end of the performance curve (which it clearly isn’t). The current Wikipedia page for SDS attempts to provide a definition, but it assumes SDS can only be delivered with commodity hardware, which also isn’t true. To a certain extent the ideals of SDS have been muddied somewhat. Hyper-converged solutions have come out of left field and gained market share that has removed the need for dedicated storage appliances in any form, whether on bespoke or commodity hardware. There’s the risk that hyper-convergence is seen as part of the SDS story, but in reality hyper-convergence looks to obfuscate and hide storage functionality rather than expose it as a service to the user. How about storage virtualisation? As a technology, storage virtualisation has provided a degree of abstraction from the hardware that has enabled certain desirable features like data mobility and extending the lifetime of ageing hardware. As discussed in this post, we have seen an evolution away from the “monolithic” storage controller that manages everything and sits in the I/O path; new solutions have come along that create a more scale-out set of solutions. 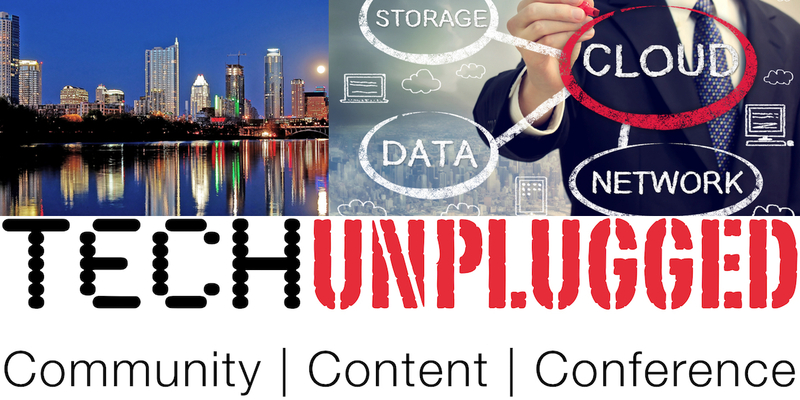 On 2 February 2016 I will be presenting at TECHunplugged, a one-day free end-user event discussing cloud computing and IT infrastructure. The event will be held in Austin, Texas (USA) at the Omni Hotel Austin Southpark and as I mentioned is free to end users. Registration can be found here – the agenda is here. My subject matter will be SDS and Storage Virtualisation. Here’s the tile and abstract. If you are in the area and able to attend the event, please register for tickets. When registering, please use the Promotional Code “architectingIT” to help me track who registered as a result of this post.